Eclectic, upbeat and clever, Victoria Vox, has been warming the hearts of her audience across the United States, Canada, Australia and Europe. Her songs are honest, moving, but also light-hearted. 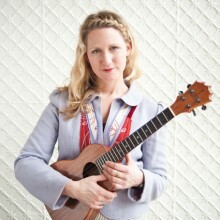 Vox earned a degree in songwriting from the Berklee College of Music and has become known among the ukulele community for her refreshingly modern and rhythmic ukulele technique. Since 2006, Vox has been a highlight at ukulele festivals around the world, where she both performs and gives workshops to the budding ukulele player. Her songs have been featured on NPR, television and in independent films. In 2009, Vox auditioned and was invited to be an Artist in Residence (AIR) at the Strathmore Performing Arts Center in Bethesda, MD, where she performed, gave a songwriting workshop, and was able to attend career meeting with other AIRs. Vox is also multi-award winning songwriter. She received First Place for her french tune, “C’est Noyé” and Runner up for the 40’s-esque "My Darlin’ Beau" in the International Acoustic Music Awards. Vox has won several WAMA awards (Washington Area Music Awards): Contemporary Folk Vocalist, Album of the Year, and Fan Favorite, as well as the "Vox Pop" (people’s choice) Award for Adult Contemporary Album of the Year with her album, Exact Change, in the 10th Annual Independent Music Awards. She has been included in Relix Magazine and Washington D.C.’s City’s Best lists of artists to watch. Also, Vox appeared on the Jay Leno Show to demonstrate her perfected mouth trumpet!